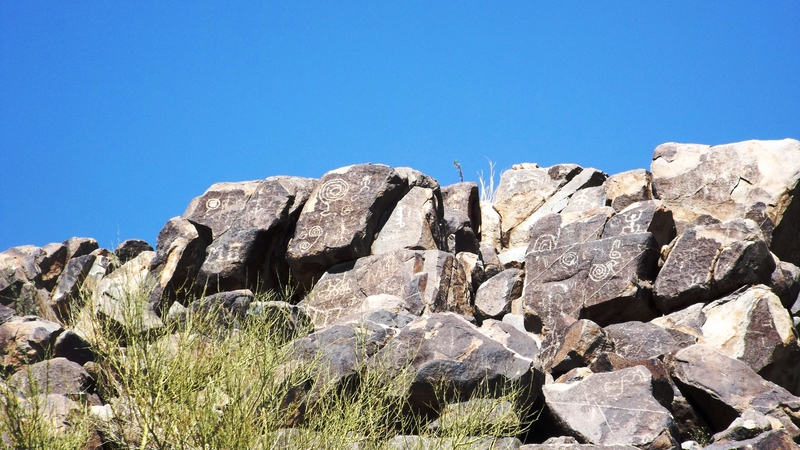 Here’s another National Park you’ve never heard of. 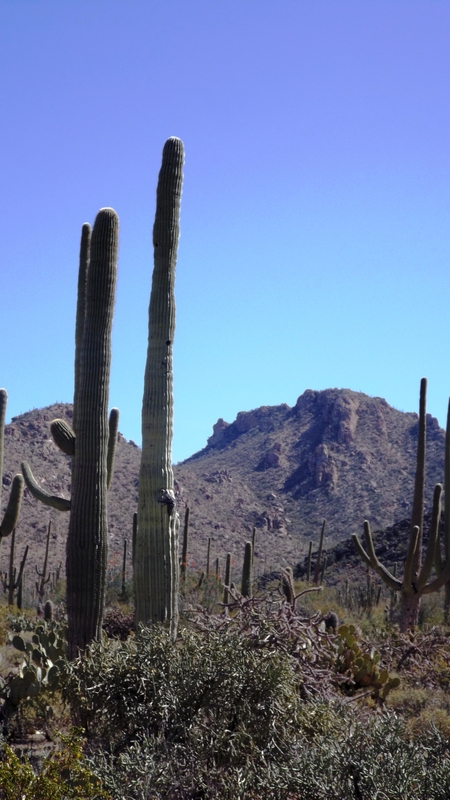 Actually there are two Saguaro National Parks; one with an old growth saguaro forest east of Tucson, the other featuring a much younger cactus forest is west of the city. We went west and didn’t look back. East supposedly presents more opportunities to view wildlife, but our experience has been that most of them are too wild for us to spot. Except that in the newer side, we saw a coyote cross the road (he was too fast for a picture). It was plain from the haughty expression on his canine features that he knew he was protected within the Park’s boundaries. 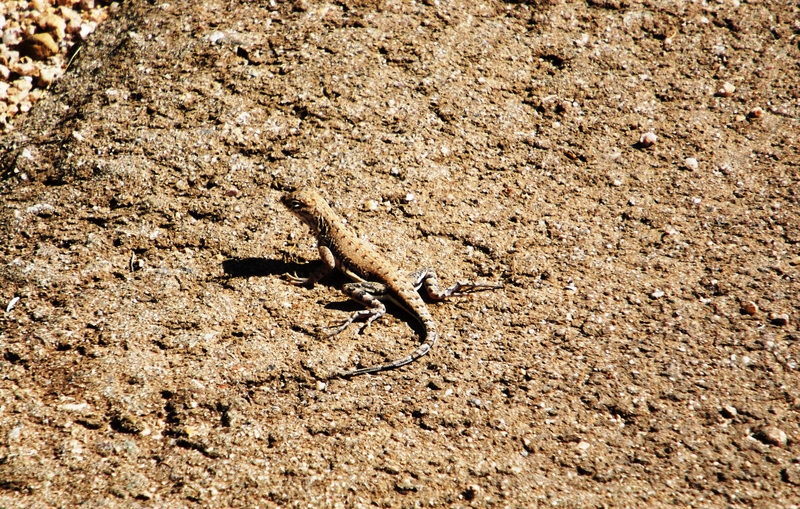 Kat got a pretty good photo of a Gila woodpecker, and this one of a zebra-tailed lizard. These were taken on a lovely half-mile concrete sidewalk that invites you on a Nature Hike just inside the park entrance. Bicyclists were out in abundance, and while the fellow in the little blue sports car wanted me to squash a particularly slow one, he was out of luck. Why visit a National Park if you’re in such a hurry to leave? The Visitors Center is cool and very helpful. Kat got some back-of-an-envelope instructions on short driving tours that end in shorter hikes. There was a lot more corduroy dirt road than anybody wanted or had bargained for, but the scenery was as spectacular as a desert’s can be. 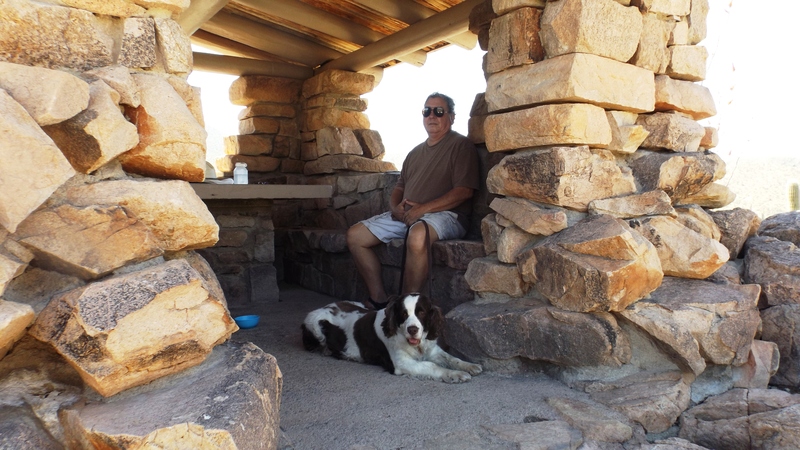 We climbed up into a rock shelter and wished we’d brought lunch; the view was from a shaded picnic table with very clear vistas. At the table with all that rock around us the temperature was 15 degrees cooler. We celebrated with the last of our water. It must have rained a few weeks earlier – barrel cactus blooms were everywhere and the ocotillo was in full riot mode. There were several spindly varieties of wildflower showing off their colors, and even the non-blooming cacti clearly had new growth and fresh, sharp spines. 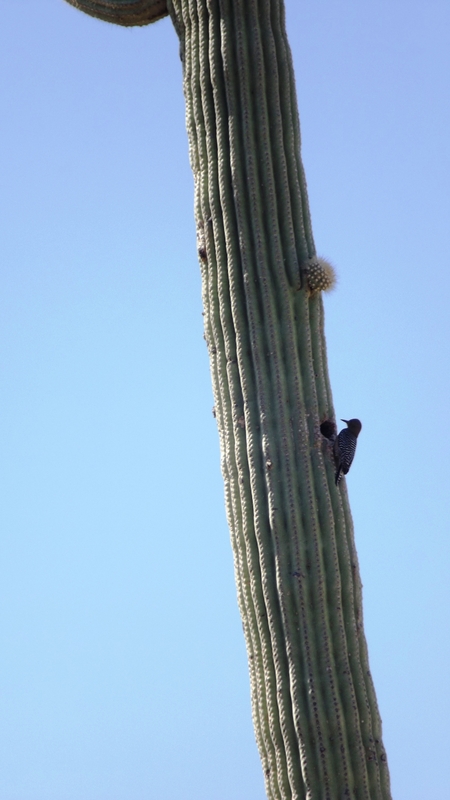 Winter is over in Tucson, and life of all kinds is visibly relieved. It was such a lovely day that we found and read a cheerful note from some long-departed soul. Kat got a superb image of it. 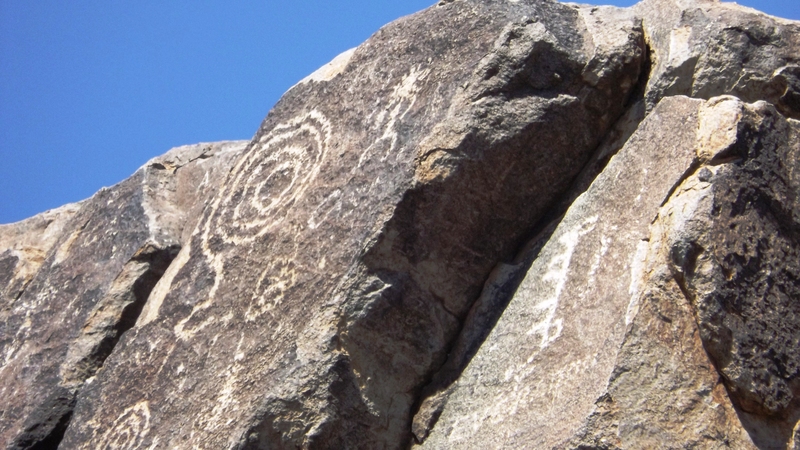 It’s a petroglyph, thought to be 800 to 1,400 years old. It was “pecked” into the rock by a hand holding a harder and sharper rock. Despite some adjacent spray paint, his message remains for all to see. Who says we haven’t heard of these parks? Heheh…just got through spending the month of February in Tucson fairly close to Saguaro National Park East and bicycled around the loop there a couple of times…lovely place. We saw a rattlesnake right in the road the first time we were there; other than that, birds were the main wildlife we noted. Yer right, it rained like a son-of-a-gun on March 1, so the wildflowers, cacti, etc. are doing very well. Em, Em, please: you are among the cognoscenti here. You already know these things. Why do you even read this drivel? Did you run right over that snake? I wouldn’t have either, unless he surprised me and putting a wheel on his neck could have saved my leg. But thanks for validating my irrigation theory. Vindication is always lovely. Hi Jackson — no indeed, I sped right by the snake, only noticing him right as I passed within 1′ of his head. He appeared to be sleeping in the road! We then stopped and backed up a bit to take a look. My husband got a lot closer to him than I dared and took a few photos. It was the first rattler I’ve ever seen “in the flesh”. We’re too old to be great anythings, except maybe obituaries. Still, everybody loves to hear a positive response. Thanks for reading us.